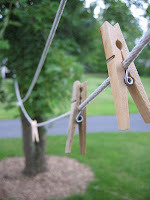 String a clothesline from one end of the room to the other at shoulder height to the average person. Pace clothespins on the line. Teams line up facing the line. The object is to run to the line, remove one clothespins with your teeth (no hands) and bring it back to the team. All team members do the same in relay fashion.